I've been singing for as long as I can remember and my love for the piano started when my parents bought a small baby grand piano for the house as my sister, Pam, was taking lessons in school (Milwaukee Public Schools - Hawley Road). She got through several grade levels and I thought played really well. I got the chance to take those same lessons when was in the second half of 4th grade, but unfortunately my training ended there because the family moved to Wauwatosa. In that one semester I did do really well in the class, but technically I was cheating, though I didn't know it. It turned out I could play by ear and I already knew the songs ahead of time because Pam had played them all for me before! 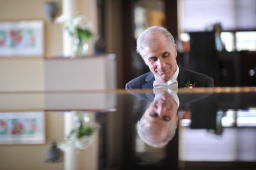 For years I simply played the melody for some songs and played the songs I learned from that one semester ad nauseam. I think I was in 11th grade when I learned that Steve Allen simply played by ear, and he could just play a tune almost automatically. How cool was that? 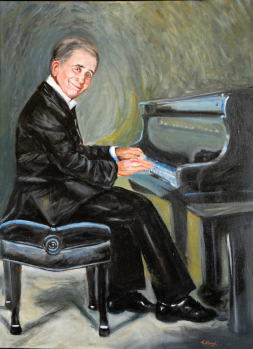 I knew from the basics that you basically play the melody of a song on your right hand and the chords on the left. 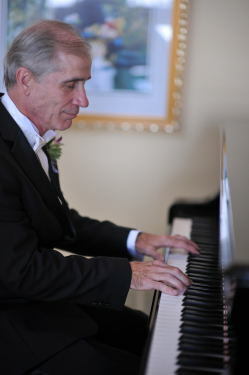 I could play a melody with ease, but the corresponding chord was often a complete mystery. That mystery got solved by complete accident. I bought a piano book of tunes by the Carpenters and just told myself I would try to read the notes. But as I looked they had the guitar chords listed along with the music. Couldn't I just play those chords if only I knew how to form them? It didn't take me long to figure out the scheme! For a long time I thought I had discovered this big secret, but of course what I had really done is simply figured out how to play by lead sheet. From then on, all I needed was a fake book. MP3 file of my piano playing. 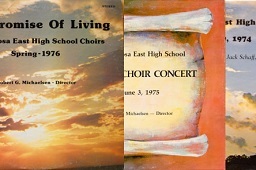 Three spring concert albums by the Tosa East Choirs, 1974-1976.